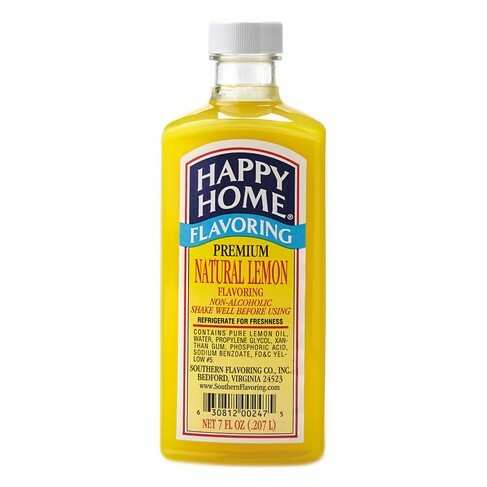 Happy Home Premium Natural Lemon Flavor, Happy Home Lemon Flavoring: Southern Flavoring Company, Inc.
We've sourced only the best ingredients for our Happy Home Premium Natural Lemon Flavor, which means the lemon flavor will be as pungent and sweet as ever. Have used it for years. Love the real taste. Have been using products since 1990. I use this flavoring in several different cake recipes and the taste is fantastic! I always get compliments and requests to make them. I started using Southern Flavoring's Premium Natural Lemon Flavoring 15 years ago. I received a catalog and decided to try it in a wedding cake. The best decision I ever made. Everyone raved about the fresh, Natural Lemon flavor of the cake. The product is far more superior than other Lemon extracts or flavorings I've tried. I use this Flavoring in all of my baked goods. It's the best flavor enhancer and a little goes a long way. I order in bulk, because I never want to be without it on hand. Owner Response: Thank you so much for the kind words! Our Lemon Flavor is one of our most popular flavors. No alcohol means more flavor! Love to cook my cakes & pies with this product! Southern flavoring is simply the 'best', we use it in cakes, puddings, jello, you name it any lemon based recipe deserves the BEST! My mother bakes cakes and we love your flavoring. She first purchased the lemon flavoring from someone who sold different product but was so glad when she found your website for herself. She believes yours is the best of any she has tried. Keep up the great work! We are always impressed with the vanilla, almond, and lemon flavors. Our business uses these the most and we are never disappointed with them! Thanks!